The ADXL337 and the ADXL377 are both small, thin, low power, complete 3-axis accelerometers with signal conditioned analog voltage outputs. The primary difference between the two is the range of acceleration they measure. The ADXL337 measures acceleration with a full-scale range of ±3 g while the ADXL377 has a full-scale range of ±200 g for measuring more extreme changes in motion, shock or vibration. Hardware Overview -- An overview of the ADXL337/ADXL377 IC's, and their respective breakout boards we designed to make them simple to use. Example Hookup -- How to connect the accelerometers to the ubiquitous Arduino so we can start writing code to work with them. Example Code -- We've written example sketches that demonstrate how to collect sensor data as well as make sense of it. Accelerometer Basics -- This is a great primer on accelerometers -- how they work, and why they're used. Accelerometer Buying Guide -- If you're not sure which accelerometer is best for you, check out this guide. Logic Levels -- The ADXL337/ADXL377 are 3.3V devices, so your analog to digital (ADC) readings will vary depending on whether you're using a 5V or 3.3V micro! Both will work, just be aware of how it affects the values the microcontroller reads. The Breakout Boards for the ADXL337 and ADXL377 break out the all the pins you'll need to get the necessary data from the accelerometers. 3.3V Power Supply Input Can be between 1.8 - 3.6V. The big alert here is that the ADXL337 and ADXL377 both have a maximum voltage of 3.6V -- that range applies to both the power supply and the self test pin. 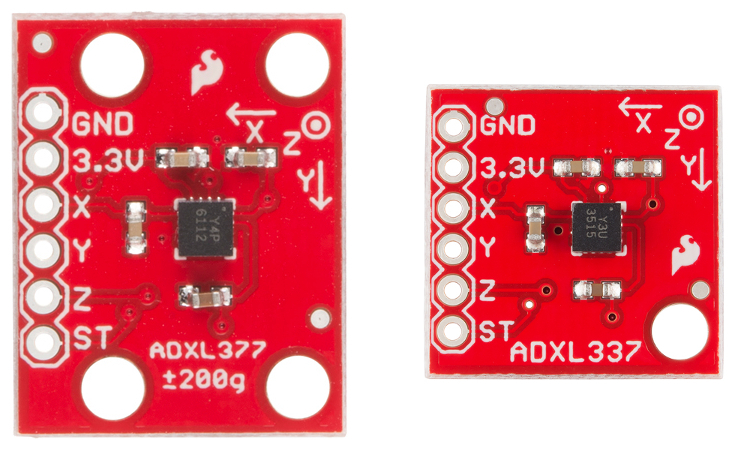 You can use a 5V or 3.3V micro with these sensors as long as you power the board with 3.3V. Be aware though, that your analog to digital (ADC) readings will vary depending on whether you're using a 5V or 3.3V micro! Both will work, just be aware of how it affects the numeric values the microcontroller reads. Fortunately, you don't need a lot of power to make the accelerometers work. In normal operating mode they typically draw about 300µA. If you are powering either the ADXL337 or ADXL377 with 3.3V, a voltage reading of 1.65V on the X pin will correspond to an acceleration reading of 0g for both chips. However, if the X pin reads 3.3V, on the ADXL337 this means a force of 3g is being applied on the x axis while the same reading on an ADXL377 would indicated a force of 200g. The usage of both chips is essentially the same, but interpreting the readings is different due to the scale that each chip measures. The ADXL377 also has 4 mounting holes, as opposed to just two, to allow for a more secure physical connection to your project since it will likely be subjected to more extreme force. Also, for both chips, 0.01µF capacitors are used on the X, Y, and Z outputs. This means the maximum rate you can collect acceleration data from the IC's is 500Hz. Before you can plug your accelerometer breakout board into a breadboard and connect it to anything, you'll need to solder connectors or wires to the breakout pins. What you solder to the board depends on how you're going to use it. We simply have to supply the accelerometer with power (3.3V and GND), then hookup the X, Y, and Z lines of the sensor to ADC pins (A0, A1, and A2 respectively in this case). The self test pin (ST) can be left disconnected or connected to ground under normal operation. If you want to use the self test to double check the functionality of the sensor, tie it to 3.3V. Check the datasheet for more info. 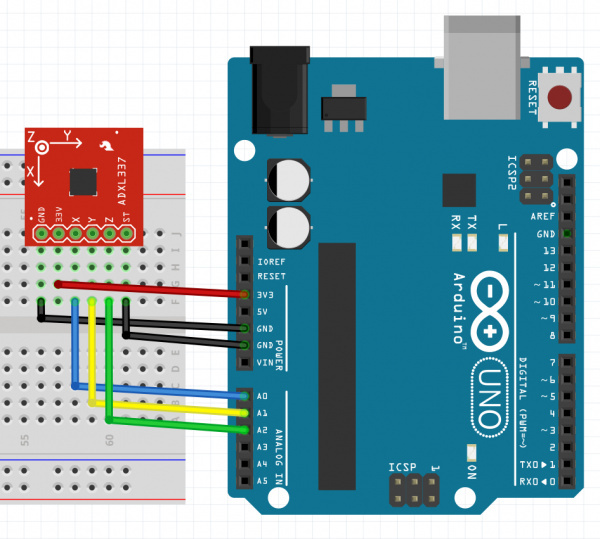 Now that your accelerometer breakout is electrically connected to your Arduino, it's time to dive into the code. The full example sketch can be found in the github repository for either the ADXL337 or the ADXL377. The code is the same with the exception of the value for the scale variable. The first two lines of code in the sketch setup configuration variables. The variable scale is set to the full scale of the accelerometer measured in g forces. It is set to 3 for the ADXL337 and set to 200 for the ADXL377, since the sensors measure a ±3g and ±200g range respectively. The variable micro_is_5V is set to true if using a 5V microcontroller such as the Arduino Uno, or false if using a 3.3V microcontroller. We want to know this because it affects the interpretation of the sensor data we will read later on. Next we use the setup() function in initialize serial communication so that we can later print sensor data to the Serial Monitor. Using the loop() function, we collect the sensor data, scale it to the appropriate units measured in g forces, and print both the raw and scaled data to the Serial Monitor. First, let's look at how we read the sensor data. We use the analog inputs A0, A1, and A2 on the Arduino and a few analog reads to get a number between 0 and 1023 that corresponds to the voltage on those pins. Those voltages reflect the latest acceleration measurement from the sensor. As an example, if the ADXL337 is measuring 3.3V on the X pin, this means it is measuring +3g's on the X axis. This in turn is measured by the microcontroller. If you're using a 3.3V microcontroller, the analog read will return 1023 and store that value in the variable rawX. If you're using a 5V microcontroller, the analog read will return 675 and store that value in that same variable instead. That's why it's important to set the variable micro_is_5V correctly so we know how to interpret these raw values. Knowing the microcontroller's voltage, will allow us to scale these integers into readable units measured in g forces correctly. Here's how we scale these values into more meaningful units. We first declare the scaled variables as floats, since we want decimal places. We then check whether the microcontroller is running off of 5V or 3.3V with the boolean micro_is_5V. Based on that we scale the raw integer value of x, rawX, into a decimal value measured in g forces, called scaledX using a mapping function. We also do this for the Y and Z axis however I left those out above since they follow the exact same process. Remember that the 675 came from the fact that a 5V Arduino will measure 3.3V as 675, while a 3.3V Arduino will measure 3.3V as 1023. The mapf() function exists in the sketch and works exactly the same as Arduino standard map() function, which you can reference here. The reason I didn't use the standard map was because it deals with integers only, and, for our purposes, we need decimal places. Thus, I essentially rewrote the exact same function using floats instead. This allows you to see the data in both forms. Afterward, we use a delay before making extra sensor reads. In the example sketch, we pause for 2 seconds (2000 milliseconds) since we are simply printing to the Serial Monitor for viewing and learning purposes. In your actual project, you can read the sensor at 500Hz at most, which means you want a minimum of 2 milliseconds in between sensor reads. Then it's back to the beginning of loop(). Hope this helps you collect and analyze accelerometer data in your own project.